Macrobiotics for Dummies is written by Verne Varona, a renowned health educator and speaker. Macrobiotics is a philosophy of dynamic living that has its origins in the Japanese culture. However, instead of adhering strictly to the traditional methods, Varona offers readers a multicultural approach to a macrobiotic diet. The macrobiotic health system focuses on creating a nutritionally balanced diet with foods that are based on human design, our relationship to the environment, seasonal patterns, and our individual health condition. Following a macrobiotic lifestyle requires that we not only pay attention to the physical, but also to all the other aspects of our life, including the emotional, intellectual, creative, and spiritual. The macrobiotic diet is based on seven major principles. View your food choices in terms of principle foods, secondary foods, and pleasure foods. Learn to emphasize seasonal and local foods. Become mindful of quantity and quality. Learn to avoid dietary extremes. Use the ‘power of five’ in food preparation: The five food groups, flavors, textures, cooking styles, and colors. Principle foods form the foundation of the diet and include whole grains, vegetables and beans. Secondary foods add balance to the diet and include sea vegetables, fruits, nuts, animal protein, and condiments. Pleasure foods are for those in good health and include small amounts of whatever you like. The macrobiotic diet should consist of 35% vegetables, 30% whole grains, 10% beans, 5-10% animal protein and 15-20% other foods such as meat, fruit, and pleasure foods. Dieters are instructed to avoid fruit juice, caffeine, alcohol, canned and packaged foods, refined and processed foods, dried fruits, sodas, red meat, pork and dairy products. In addition to these general recommendations Varona outlines four specific dietary templates: The new multicultural macrobiotic template, the convenience-food eater’s template, the macrobiotic weight-loss template and the healing diet template. These are designed to offer more specific recommendations for those who would like to refine their diet further in order to meet a specific need or goal. Brown rice, oatmeal, whole wheat bread, legumes, tofu, tempeh, vegetables, fruit, miso, soy sauce, fish, eggs, nuts, seeds, bancha tea, roibos tea. Macrobiotic dieters are advised to regard exercise as an essential part of a self-healing regime and another source of nourishment. Varona explains that exercise puts you back in your body and provides a centering effect that stabilizes your thinking and creates calmness. The benefits of different forms of exercise are outlined and a special emphasis is placed on activities that stimulate the lymphatic system including rebounding. This is said to be vital for improving the removal of waste and delivery of nutrients to the cells of the body, which can reduce the risk of many of the diseases that are associated with aging. 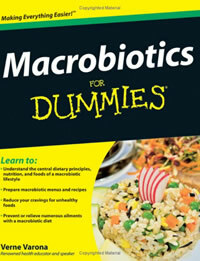 Macrobiotics for Dummies retails at $19.99. Presented in a way that is very easy to understand. Provides information about nutritional concepts. Encourages the intake of low glycemic index carbohydrates. Includes a one-week sample menu and a large selection of recipes. Can be customized to suit individual requirements. Includes specific recommendations for diabetes, heart disease and digestive disorders. Does not require dieters to become a vegetarian. Provides tips for transitioning to a macrobiotic diet. Addresses all of the factors that may contribute to improved health. Requires a lot of time to be spent on food preparation. Many foods must be eliminated including dairy, meat, sugar, caffeine, and alcohol. Some dieters do not do well with a high intake of grains. May be difficult to eat out. Places limitations on the intake of raw fruit and vegetables. Macrobiotics for Dummies offers a clear introduction to the macrobiotic philosophy. Nutritional concepts are explained with clarity and detail, however Varona also offers dieters a template for managing all of the aspects of life that are involved in the creation of good health. One of the strong points of this particular program is that it does not strictly adhere to the traditional Japanese approach but includes a wide variety of foods from different cultures, which makes the diet more interesting and makes the macrobiotic diet more appealing to the Western palate.